GFS Electronic Imports, was formed in September 1977 by two partners, Greg Whiter and Fred Swart. 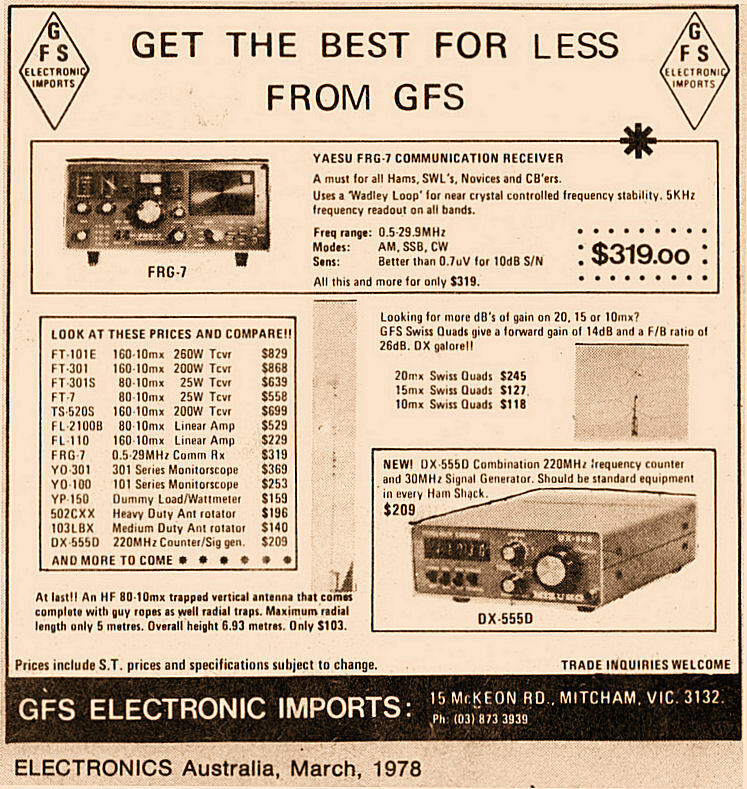 Nineteen Seventy Seven saw the height of the CB radio boom in Australia and many new businesses appeared around this period to service the new and growing Citizens Band Radio and Amateur Radio market place, GFS Electronic Imports being one of them. The editorial shown above appeared in the October 1977 edition of CB Action and served to introduce the new business to the magazine's Australian readers. Both Greg Whiter and Fred Swart came from backgrounds in radio communications and had spent their previous employment working together at Bail Electronic Services, the company which first introduced Yaesu Musen SSB equipment to the Australian amateur radio operator in the early 1960's. Shown HERE is a 1974 photo taken in Bail Electronic Services showroom of Bail's staff of the period, including Fred Swart and Greg Whiter. Prior to working for Bail Electronic Services, Fred Swart had spent a number of years employed by Philips-TMC in their two-way radio manufacturing service department. Greg Whiter had worked for Bail Electronics from 1970, initially part time while still studying at the Royal Melbourne Institute of Technology. By 1977 both felt they had gone as far as they could with Bail Electronic Services and that it was time to start a business of their own. 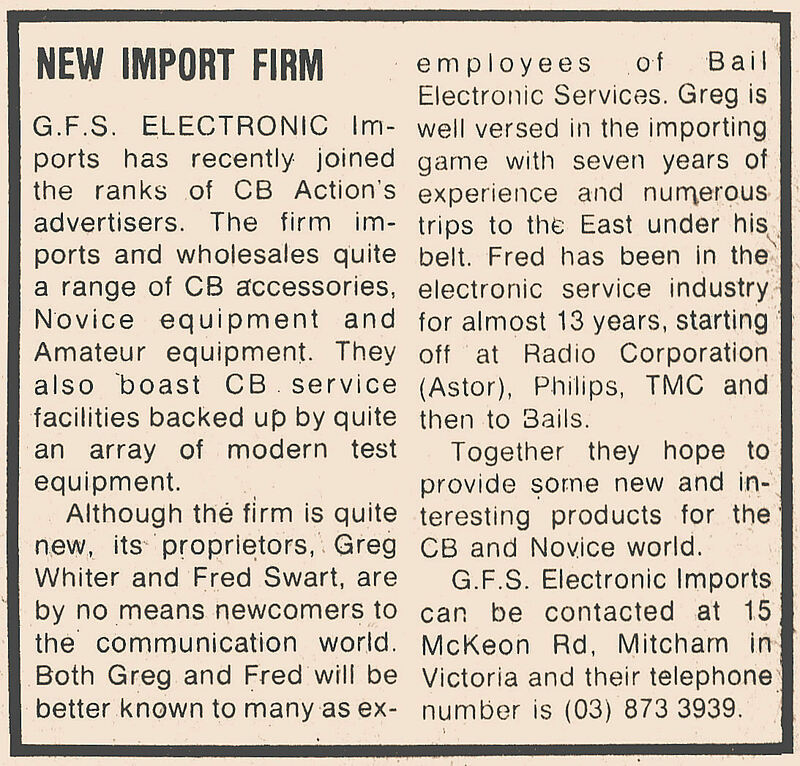 The business name 'GFS Electronic Imports' was registered, the letters GFS being derived from Greg & Fred Swart. A suitable premises to operate the new business from was found at 15 McKeon Road, Mitcham, Victoria. As it had previously been used as a butchers shop, quite an effort was required to remove the smell of meat, particularly from the floor, before they could move in. By May of 1978 Greg Whiter had purchased Fred Swart's share of the business, Fred Swart going on to run his own business, Chirnside Electronics, mainly manufacturing a range of amateur radio and CB antennas. 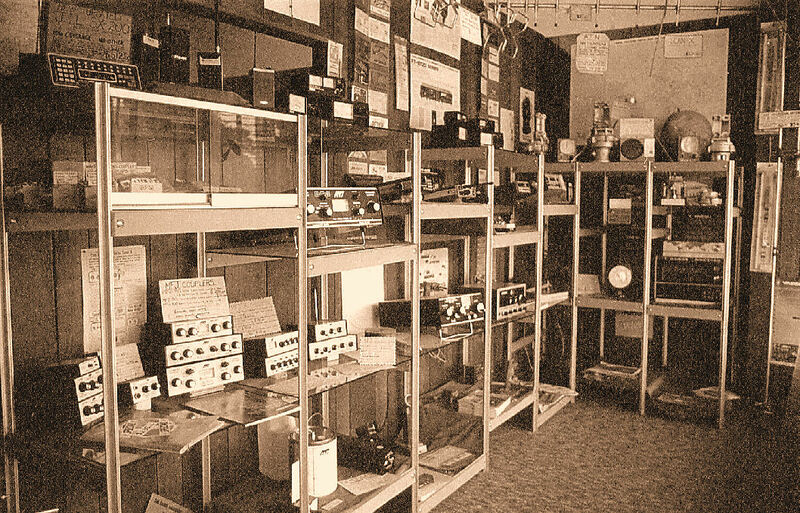 Shown above left is a photo of GFS Electronics' first premises at 15 McKeon Road, Mitcham, Victoria. By the time this photo was taken in the early 1980's Greg, and his wife Jackie Whiter, had formed a proprietary limited company, G.D. & J.A. Whiter Pty Ltd, to operate GFS Electronic Imports. 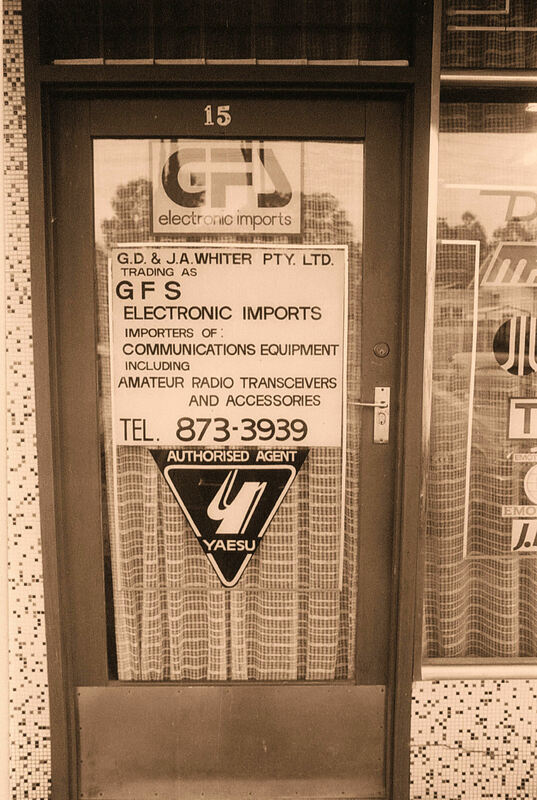 In 1983 GFS Electronic Imports moved to a larger premises next door, at 17 McKeon Road, Mitcham, Victoria. 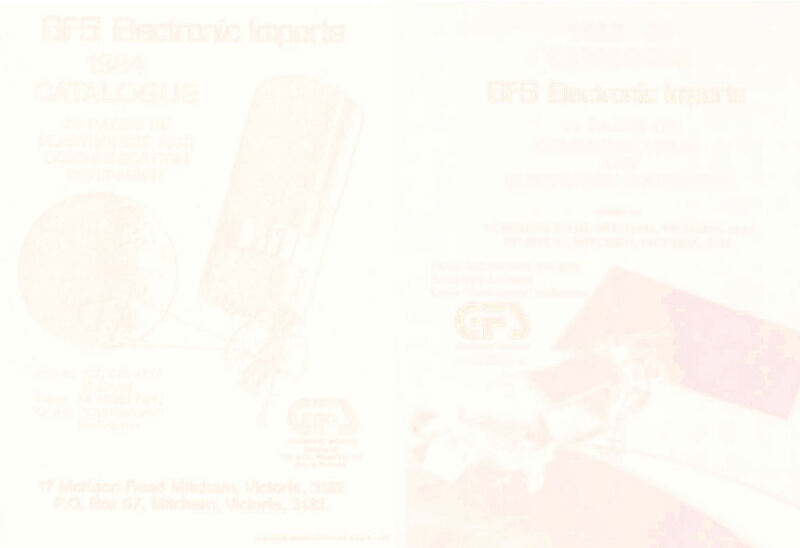 Shown above right is GFS Electronic Imports first advertisement, which appeared in CB Action Magazine in October 1977. GFS Electronic Imports first AR (Amateur Radio) magazine ad appeared in the December 1977 issue, as shown above. From the ad it can be seen that some of their earlier products included Swiss Quad beam antennas, Antenna Rotators, as well as Yaesu Musen's FT-101E and FT-301 HF transceivers. The photo above is of a section of GFS Electronic Imports early workshop area at 15 McKeon Road, Mitcham, Victoria. Greg Whiter appears to be servicing an early Yaesu Musen SSB transceiver, probably a model FTdx-401. 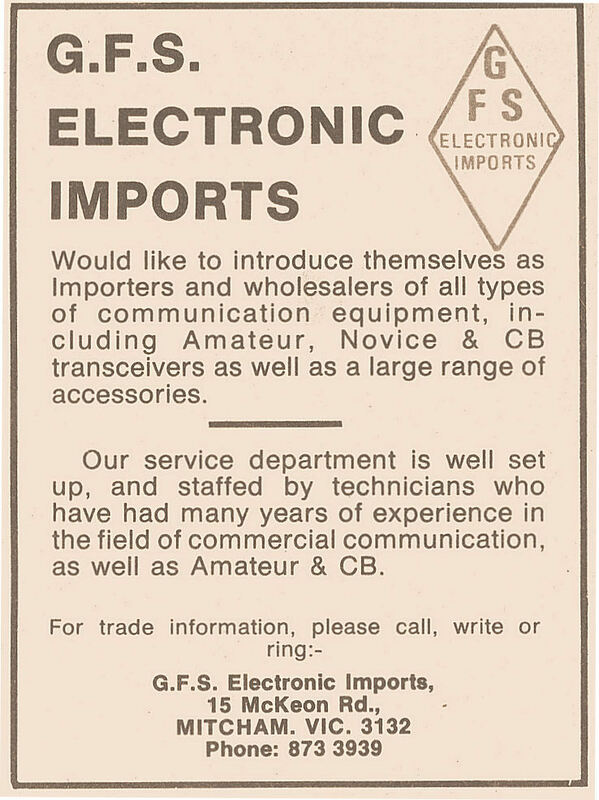 In the early 1980's Jak Melia joined GFS Electronic Imports to handle their communication equipment service work. Jak can be seen above working on an HF transceiver. 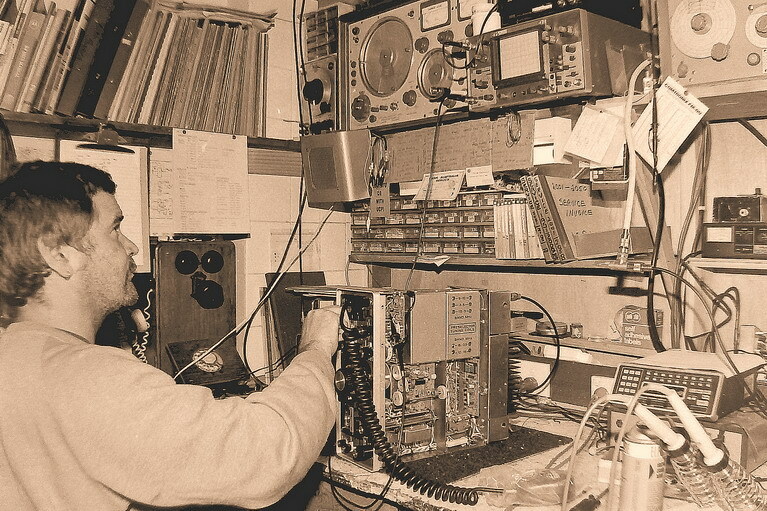 In the late 1980's Jak Melia went on to start his own company, QD Electronics, which specialised in servicing amateur radio and CB communication equipment. 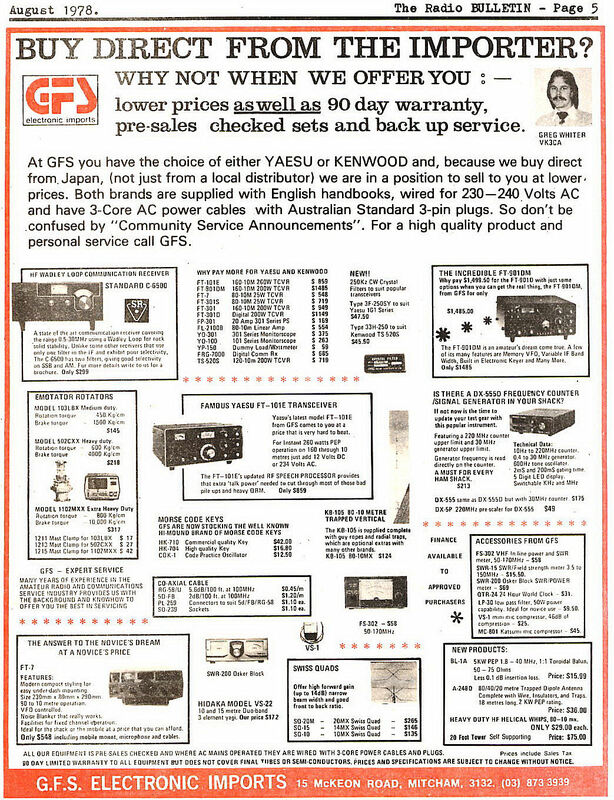 As can be seen from GFS Electronic Imports Electronics Australia magazine advertisement of March 1978, the business soon diversified from its initial start selling just CB radio accessories to selling a range of amateur radio products, particularly those from Yaesu Musen Company in Japan. 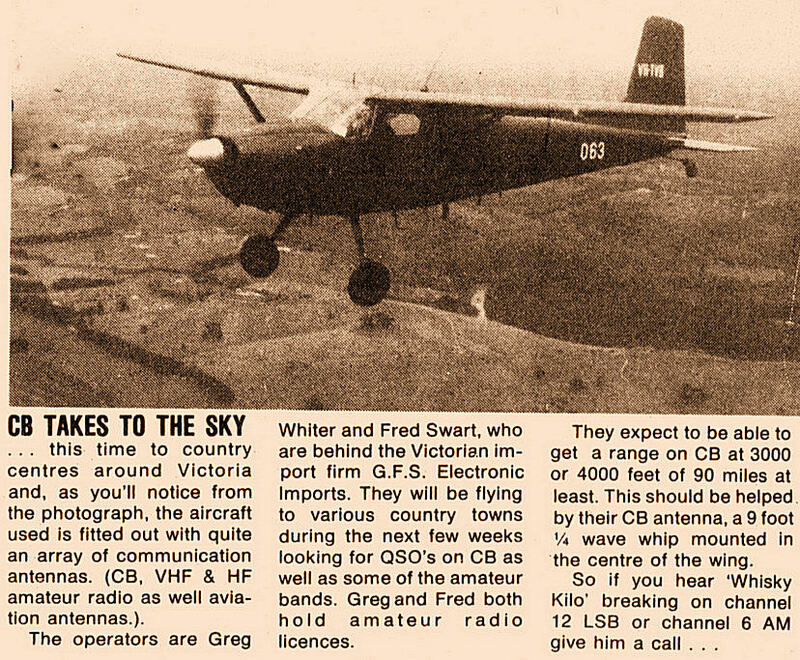 Taking a step back to this CB Action magazine editorial of November 1977 above, details are given of a planned trip that Greg Whiter and Fred Swart intended to make around Victoria in an ex Australian Army Cessna 180, which was partially owned by Greg's father, David Whiter. 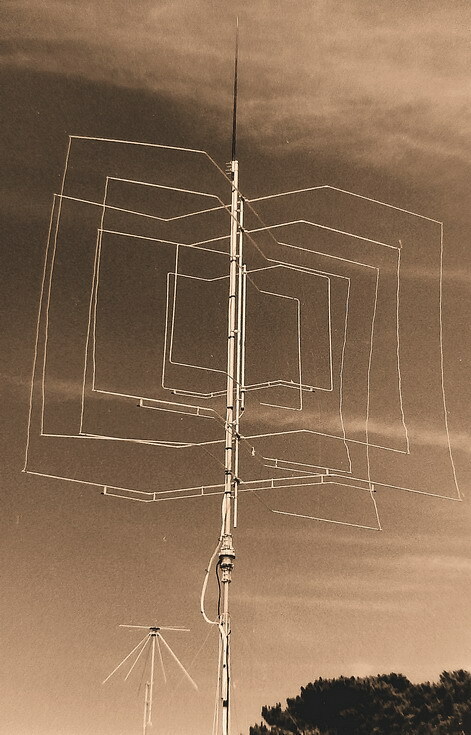 The aircraft was equipped with a 9 foot whip antenna, originally used for army communications, which operated very well on the 27 Mhz citizens band. The Cessna 180 also had VHF whip antennas as well as an HF wire antenna, so was well suited to aerial communication on both the amateur radio and CB bands. This aircraft, whose original registration was VH-TVC, later became VH-HQA and these days lives with a later owner in the Kinglake ranges north of Melbourne. 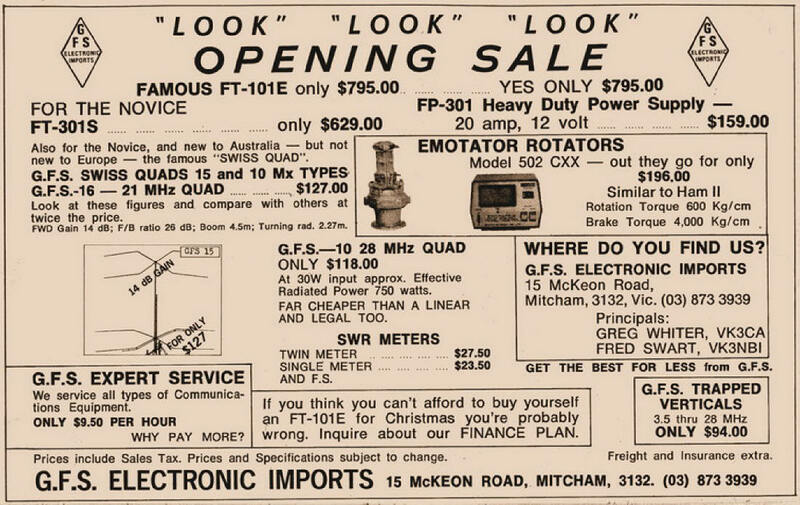 By August 1978, as this advertisement in the Eastern and Mountain District Radio Club's magazine The Bulletin shows, GFS Electronic Imports product range had been greatly expanded. Products included various Yaesu Musen transceivers, antennas for base and mobile operation, co-axial cables, antenna rotators, frequency counters and a wadley loop HF communications receiver, the C6500 manufactured by Standard Communications in Japan. In April 1978 the company's logo was changed from the diamond shape seen in earlier advertisements (and shown to the left), to the stylised 'GFS Electronic Imports' shown to the right. This later logo can also be seen in the August 1978 advertisement shown above. The company's first logo was designed by Fred Swart's brother, while the latter was designed by an associate of Greg Whiter's at that time, Neil Spencer, who had been studying graphic design. 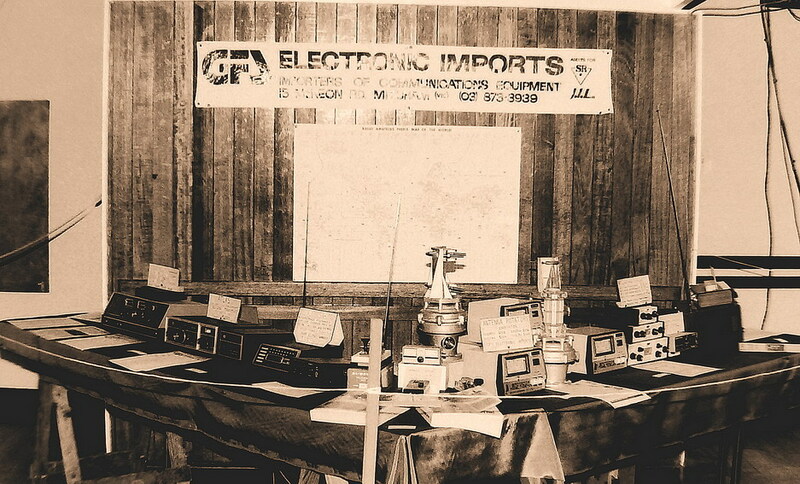 The early display area at GFS Electronic Imports' 15 McKeon Road office was initially quite spartan, as can been seen from the photo above left. 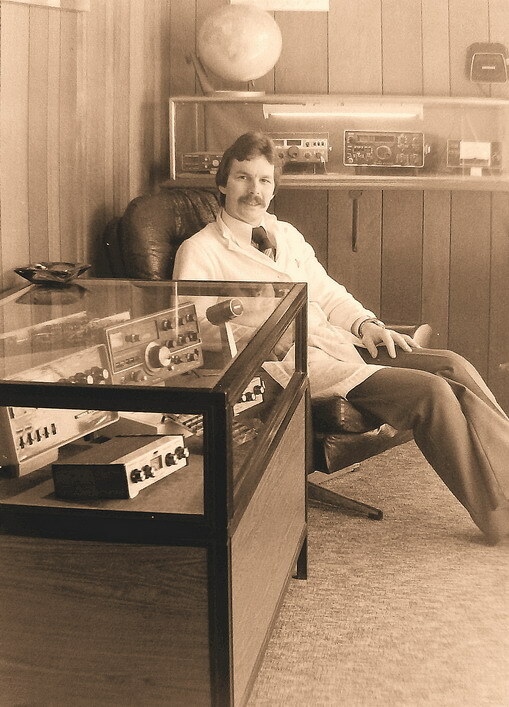 Greg Whiter can be seen sitting with an FT-7 and FT-301 in the background along with a TS-520 and FL-2100 in the foreground. Swiss Quads manufactured by TET in Japan were a popular high performance antenna import for GFS Electronic Imports in the late 1970's. Shown above right are a nested triplet of 15, 10 and 6 metre Swiss Quads located on a tower on the roof of GFS' 15 McKeon Road, Mitcham, Victoria office. Shown above is GFS Electronic Imports' later 15 McKeon Road showroom. The photograph was taken around 1981 and gives an idea of the large range of products the company sold by that time. Most of the products then marketed were for amateur radio use, with a move away from CB radio. Scanners had also become prominent in the company's sales figures, as GFS Electronic Imports were exclusive Australian distributors for JIL (Japan Industries Limited) who manufactured the then popular models SX-100 and SX-200 programmable scanning receivers. An SX-200 scanner can be seen in the top left hand corner of this photo. Also seen at the lower left of the photo are a number of MFJ Enterprises' products, for whom GFS were Australian distributors. The most popular of MFJ's products were their antenna tuning units, however they also manufactured such things as electronic morse code keyers, dummy loads and receiver converters. MFJ Enterprises were located in Starkville, Mississippi, USA. Airband receivers were also a popular product around this period. GFS Electronic Imports had a hand held crystal controlled/tuneable unit called the 'Skyace', which can also be seen third from top left in the photo above. In the late 1970's to early 1980's, Victorian Country Fire Authority volunteer fire fighters had a need to monitor one or more of the seven VHF highband FM communication channels then in use by the CFA. GFS Electronic Imports provided a solution to this requirement in the way of two cigarette packet sized crystal controlled receivers. Known as 'Listening Sets' they were the models FS-10 and PK-1. The FS-10, having a cascoded RF amplifier stage, provided unusually low noise high sensitivity and consequently excellent long range performance. GFS also marketed a similar sized receiver with a built-in low powered 80 milliwatt transmitter, the Standard Radio model C-800, which could be used for short range two way communication. A C-800 can be seen fourth from the left top in the photo above. 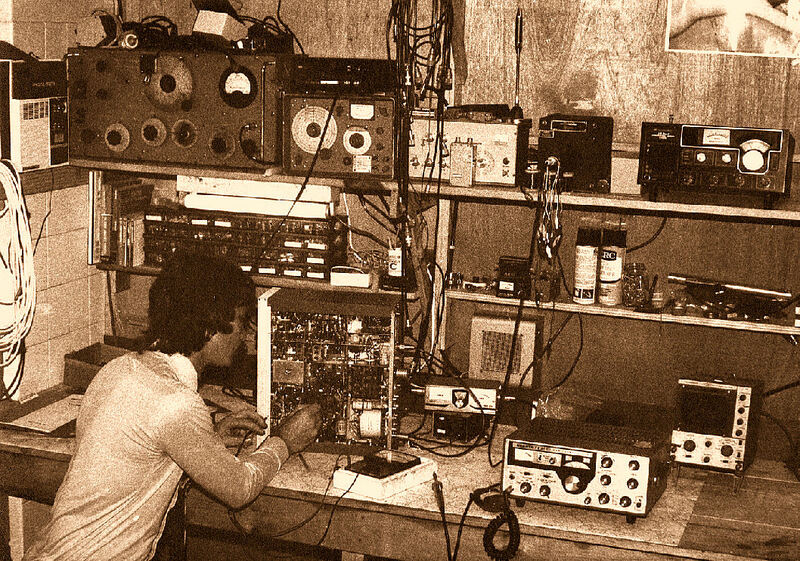 GFS Electronic Imports attended a number of amateur radio conventions in the early 1970's. Shown above is their display at the July 1979 Geelong Amateur Radio Club convention at Geelong, Victoria. At this stage GFS were handling American manufactured Atlas equipment and a couple of Atlas HF SSB transceivers can be seen at the far left of the photo. Other equipment included an SX-100 scanner, Emotator antenna rotators, Hi-mound morse code keys and MFJ antenna tuning units. 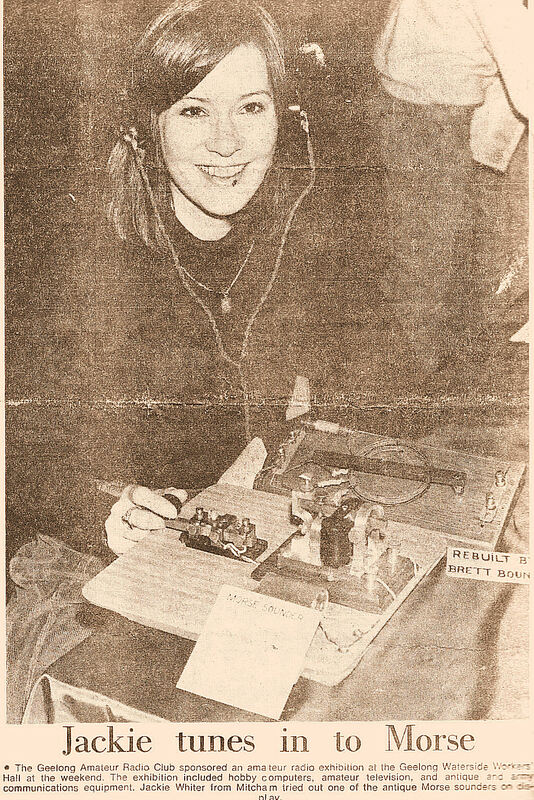 Jackie Whiter, Greg Whiter's wife at the time, and partner in GFS Electronic Imports, can be seen below as she featured in the Geelong Advertiser newspaper on Monday July 2, 1979, after her photo was taken at the convention operating an old morse code key and sounder.